It's a strange thought to consider that whenever Stoke City play a football match, a small corner of West Africa follows with almost religious fervour. Although few Senegalese knew about England's second-oldest football club before this season's Premier League debut, Stoke City players now regularly adorn the front cover of the nation's sports papers. That's because the club, founded 97 years before Senegal achieved independence in 1960, now have five Africans from the same nation on its books. "It is quite strange when you consider that we could theoretically have all five playing at the same time - it's nearly the Senegalese national side!" says one young fan. Salif Diao was the first to join in January 2007 but the Senegalese contingent really picked up last August when midfielder Amdy Faye and defenders Abdoulaye Diagne Faye and Ibrahima Sonko all signed. In January, striker Henri Camara became Stoke's fifth Teranga Lion when arriving on loan from Wigan Athletic - and the tally could have been six had Lamine Diatta impressed during a transfer window trial. The former national captain was rare in being a Senegalese unable to win over manager Tony Pulis, who has brought in all the West Africans since taking charge in 2006. "It's happened because they are good players and I've been trying to bring in good players - I don't look at colour, creed or anything like that," the 51-year-old told BBC Sport. "They bring a different culture to the football club and they've really mixed in with our players: it's been very, very good." Perhaps none more so than in the case of Abdoulaye Diagne Faye, the centre back having started all but two league games this season and fast becoming a cult hero at the Britannia Stadium. Unquestionably the most popular of all Stoke's Senegalese, as borne out by his shirt sales in the club shop, the Premier League's loudest crowd regularly lauds the player with chants of 'Abdoulaye, My Lord' - to the tune of 'Kumbaya'. "There's a very good atmosphere here, it's like a big family, and I'm very happy to be one of five Senegalese here," the former Newcastle and Bolton man tells BBC Sport. In fact, his compatriots are often to be found at Diagne Faye's house savouring music from their homeland as well as his Senegalese wife's local cuisine. "The English like to eat things like cheese and chicken but I don't really like English food - I prefer my wife's cooking," says Diagne Faye. Among the favourites are such Senegalese specialities as thieboudiene (a rice and fish dish) and the peanut-based mafe. "When I go round to Abdoulaye's, it reminds me of my mum's cooking which is great," says Sonko, the 28-year-old who has struggled for a starting place this season. Now while the quintet have brought a small part of their sun-drenched and sand-swept Islamic nation to the green fields of Stoke, they're conscious of the cultural exchange working the other way as well. 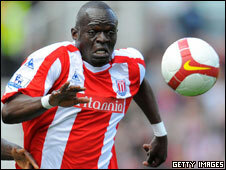 "Whenever Stoke play, my friends tell me all Senegalese are watching the game because of us," Diagne Faye explains. "Sometimes when we lose, people ring me to ask what happened but they call when we win as well. They like Stoke and at the moment, they are happy." 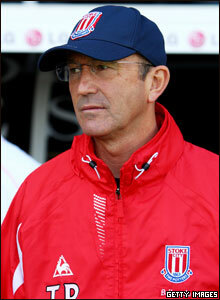 Buoyed no doubt by the fact that the Potters are all set to defy both the drop and many experts' pre-season predictions. Aside from Camara, whose playing time has been restricted to just three substitute appearances by the form of James Beattie and Riccardo Fuller, all the Senegalese have weighed in this season. Sonko (13 appearances) has deputised at the back when needed while Amdy Faye (21) and Salif Diao (18) have bolstered the midfield whenever injury has eluded them. With his whole-hearted commitment not to mention three vital goals, Diagne Faye has stood out on the pitch although it's not the only place the 6ft 2 defender makes his presence felt. "They don't come much crazier than 'Big Abby'," says Rory Delap. "He's off his head with his noises and his laughing - you turn around and expect to find a big old woman set behind you but he's there with his big high-pitched laugh! "But they all muck in, joining in with the banter, and they all speak very good English - none of them struggling like they do at some clubs." Yet the one 'failure' for the five Senegalese, praised for their intelligence by some Stoke employees, is their inability to appear on the pitch at the same time. That's despite the whole quintet often making a match-day squad but sadly the players' dream scenario will not be happening this season - and maybe never. For Camara is due to return to Wigan at the end of a season which has already ended for Amdy Faye, whose troublesome back was reported to need surgery on Thursday. Nonetheless, the five have already done enough to ensure that Stoke City will forever occupy a footballing corner of Senegal. "Stoke has definitely got some fans now and our media are really following the results and performances of 'Little Senegal' as some call them," says local sports journalist Aliou Goloko. "In fact, the media features with near-daily reports on our players there." And with relegation all but avoided, the incongruous sight of proud Senegalese sporting Stoke's red-and-white striped jersey on Dakar's dusty streets is long set to continue.